Sorry about the double posting from my old blog. I was a little wrapped up transcribing the records of First World War Newfoundland servicemen for the Trail of the Caribou, and trying to get ready for Sci-Fi on the Rock. Very different, I know, but I did represent dieselpunk at the Steampunk Newfoundland presentation about different branches of steampunk. 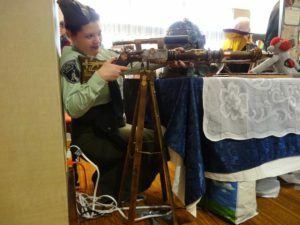 Dressed in dieselpunk, playing with the steampunk gun made by FoamWerx Cosplay at the Steampunk NL table at SFotR. Photo by Brent Slade. Anyway, I finished reading Mr. Cooper’s book a few weeks ago, but was really trying to figure out how to write a review of it. Tales from a Pilot’s Logbook by Royal Cooper is a fascinating read, and in a different way from many of the other books that are available. There are always official histories and memoirs written by decision makers, but often some of the most informative works are those by the average pilot. Cooper certainly paints himself as an average pilot, but with all of the adventures, near misses, and events in his career as a pilot, it makes a reader wonder what being an average pilot really means. Cooper frames his book with his early brush with aviation, seeing Italo Balbo’s Italian Air Armada land in Shoal Harbour in 1933. 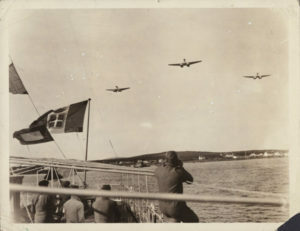 In fact, it is an image of the Armada which he says looked like a “swarm of bees” approaching Shoal Harbour. This incident awaked the passion so often found in pilots, and gave Cooper the inspiration to be an aviation while the need for pilots in the Second World War gave him the opportunity. He uses an image of the aircraft to end every chapter, which consistently reminds the reader how a young boy in Shoal Harbour fell in love with aviation and kept that memory throughout his career. Cooper’s career began with the 125 (Nfld) Squadron in the Royal Air Force. While I won’t go into details, he tells of exciting flights, near misses, and his run-ins with the enemy. 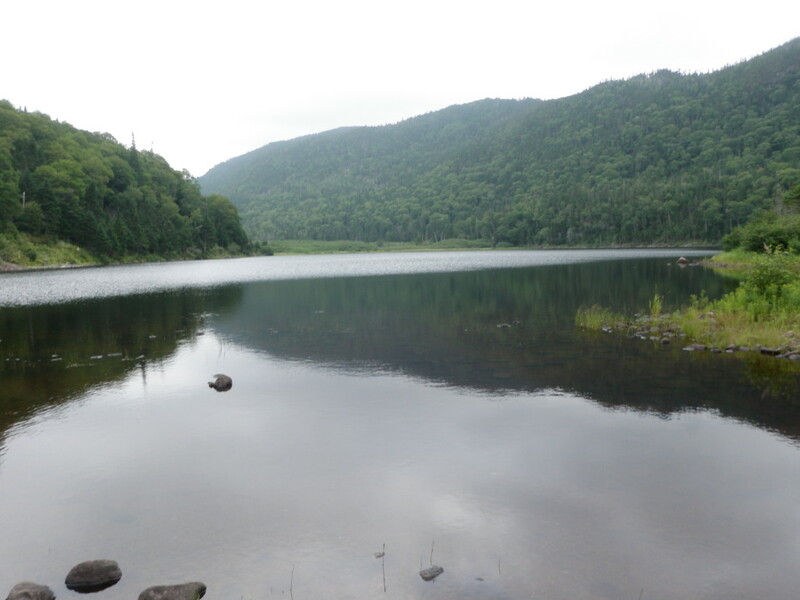 What struck me the most was how Newfoundlanders are Newfoundlanders no matter where they are. Each person from the 125 (Nfld) Sqdn. was framed not just by their name and role, but also where they were from. It’s a strong Newfoundland feature, where one of the first questions you are ever asked is where are you from and where is your family from. No matter how modern we might get, Newfoundlanders always have that sense of place, especially when overseas and so very far from the comforts of home. 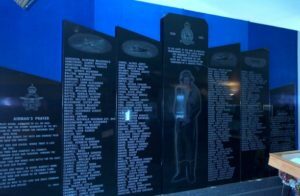 Cooper also had a hand in creating the Airman’s Memorial at the North Atlantic Aviation Museum, a monument meant to remember those Newfoundlanders who lost their lives in Allied Air Forces in World War II (Shapleigh and Moss 2000). 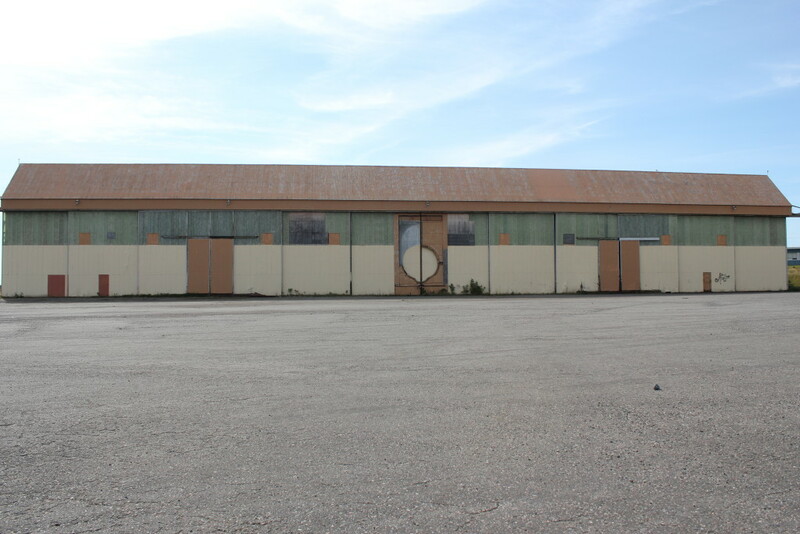 Airman’s Memorial at the North Atlantic Aviation Museum before their museum was remodeled. 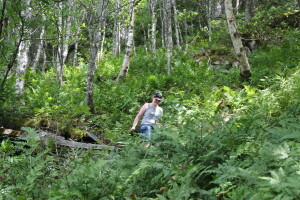 https://www.cdli.ca/monuments/nf/gander.htm. The FIDO operation was located on a very long field with pipes parallel to and about 200 feet from each side of the runway. Fuel was pumped into these pipes under high pressure and ignited like a giant blowtorch. 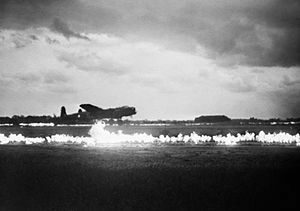 The result was two walls of flame rising about ten feet in the air which would burn off the fog near the runway and also provide visual reference for pilots when no other options were available. […] This saved a great number of aircraft which would otherwise have been lost. I got to use it once or twice at Bradwell Bay, and it was the most eerie feeling, to be running between two walls of fire. I could feel the heat in the cockpit and got out of it just as soon as I could (Cooper, 1999, 31). They had 1,000 yards of approach and 1,000 yards of runway equipped with FIDO burners within about six weeks of my giving the OK to go ahead. The burners consisted of long lengths of pipe, with the feed along a pipe over the burners so that the flame from each jet impinged slightly on this top feed tube, thereby vapourising the petrol that it fed along it, and ensuring that no neat petrol came out of the jets, but only pure vapour. This was obviously essential if it were to improve visibility and not to do the opposite. These burner pipes were laid parallel with the runway and about 50 yards from it; thus the burners were a total of 150 yards apart. They extended along each side of the runway and out into the approach area, so that the intense heat which generate cut a chasm through the fog which could be seen from above and the aircraft could fly down into this chasm and land on the runway (214). He describes his first landing with FIDO as “I had vague thoughts of seeing lions jump though a hoop of flame at the circus. The glare was certainly considerable, and there was some turbulence” (214). An aircraft landing at a FIDO airport. From Wikipedia. The contrast is that Cooper lets a reader who has never experienced FIDO a much clearer idea of what it is, how it works, and what it’s like top fly into that situation, whereas Bennett is looking at it strictly from a functional point of view, which is fair seeing as he was one who had a say in its use and had to look at it more from a functionality point of view. After the war, Cooper jumped around Canada as a pilot before settling in Gander working as a commercial pilot and as a bush pilot. Like his military career, his civilian career is equally exciting, and his memoir is full of terrifying, funny, and exciting stories. I plan to highlight a couple of those stories, but keep in mind each are told quickly in the book before he moves on to another. 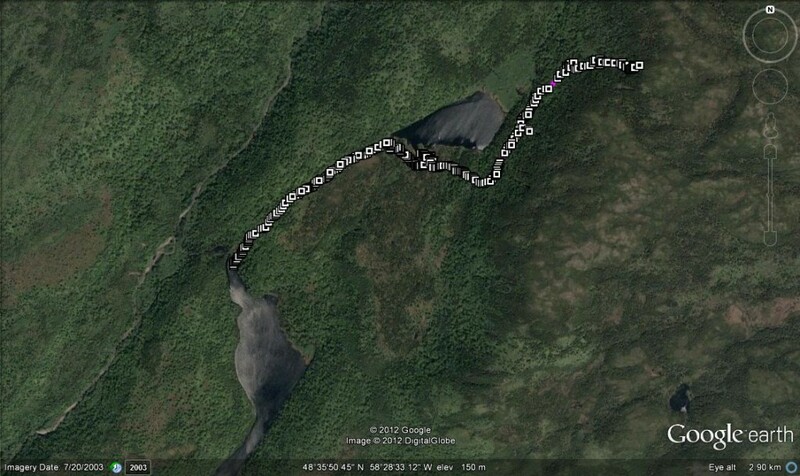 September 19, 1951, a Buchans Mining Co. Norseman crashed near South Pond, 25 miles north west of Buchans. Pilot Tom Mattinen, Dr. J. H. MacLean, chief geologist of the Buchans Mining Company, Ralph Barnes, George Pike, Patrick O’Keefe, all three geologists, and Roy Moran of Oakville and Douglas Derry of Toronto, engineers with Spartan Air Services, were all killed in the crash. Moran and Derry were visiting the pilot, and were going to be transported to Deer Lake where they were to work on Spartan helicopters who were having engine troubles (Dean 2000). On September 30, Captain Jerry McInnis and Cooper took DC-3 BXZ to pick up passengers in Buchans who held a funeral service while they flew over the wreck and dropped flowers from the aircraft. 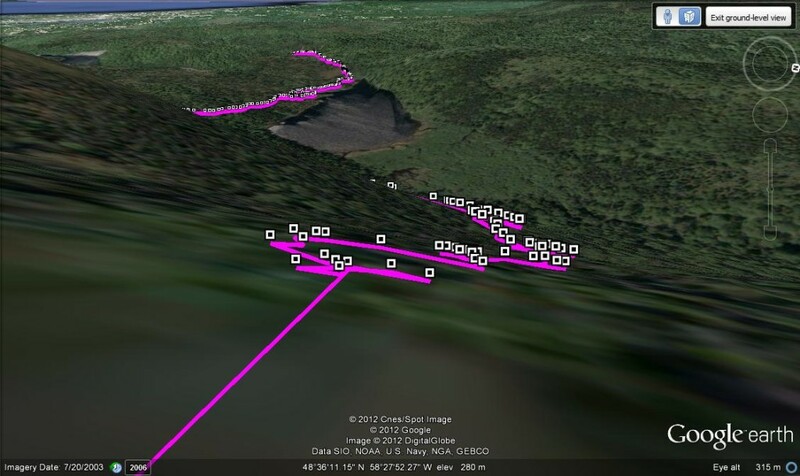 Such a service was not unusual for more isolated crashes, and a similar one happened over the 1946 American Overseas Airlines crash near Stephenville, NL. Cooper was part of a long history of aviation seal spotting in Newfoundland and Labrador. In 1956, he went on his first seal spotting flight around the Strait of Bell Isle, and continued to work as a seal spotter for the next 15 years. Seal spotting started in Newfoundland with Sidney Cotton in the 1920, the sealing companies seeing the importance of aerial seal spotting and surveying for to guide seal hunters, making trips more productive and safer (Stone 2015). According to Cooper (1999) “unless you have seen a large seal herd, it is hard to believe that such a number of animals could concentrate in one area” (81) and “I did seal-spotting for over fifteen years, and to me, it seemed the herds were as large in 1972 as they were in 1956, the year I started” (82). 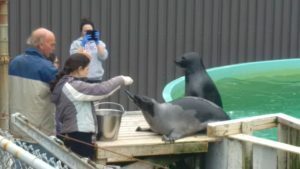 Seals at the Ocean Sciences Centre. Photo by author 2014. I remembered that I had lost some very good friends on March 17, 1944. We lost two aircraft and crews on 125 Squadron in the RAF. Then on March 17, 1965, I lost two friends when EPA Dart Herald CF-NAF crashed in Nova Scotia, killing Captain Ray Murnaghan and First Officer Ross Clements (152). Spirit of Harbour Grace. Photo by author 2012.
Cooper seemed to have had a hand in quite a bit of the aviation commemoration around the island. 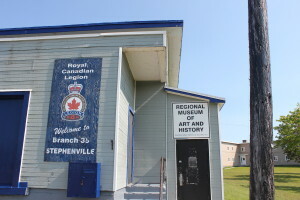 He was involved in the annual reunions of 125 (Nfld) Squadron, which expanded to 125 (Nfld) Squadron and Allied Air Forces Association, and was involved in the erection of the above mentioned Newfoundland Airman’s Memorial. 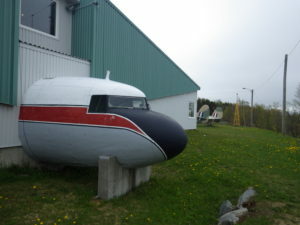 He was one of the founding members of the North Atlantic Aviation Museum (NAAM) in Gander, and flew many of the aircraft that are now situated as memorials around Newfoundland. Some of those aircraft including his last flight in a DC-3 being CF-QBI which became the Spirit of Harbour Grace. He also flew Beechcraft B-18 CF-VPK from Toronto to Gander for it’s final home as a display outside of NAAM and flew DC-3 CF-GHX, which is now part of the Gander aviation museum. This and his work on Gander town council is most likely Mr. Cooper has a street named after him in Gander (Cooper Blvd. 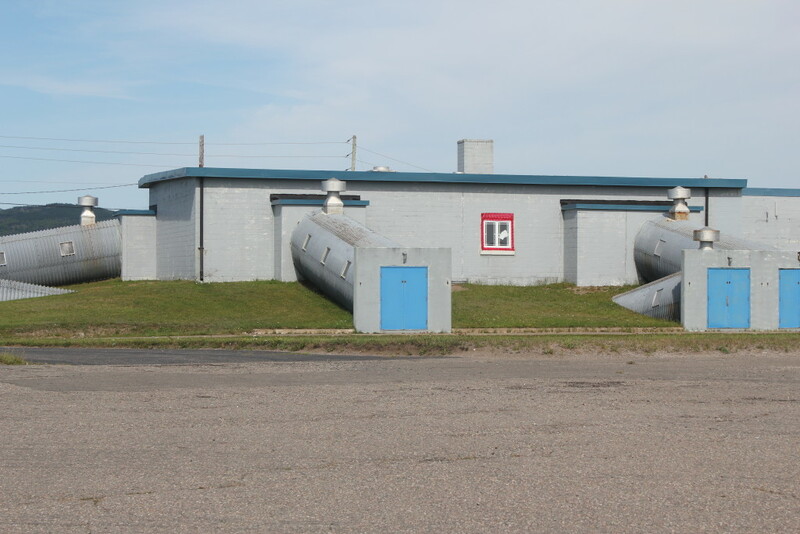 ; see more at the Gander Airport Historical Society). DC-3 as part of the North Atlantic Aviation Museum. 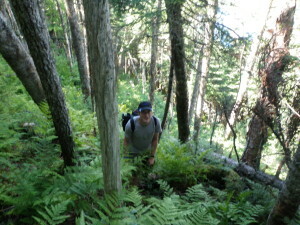 Photo by author 2014. Royal Cooper took his flight logs and used them to write a fantastic memoir that I would encourage anyone with an interest in aviation or in Gander history to read. It is interesting, and tells the story of someone who loved his work, and who helped shape Gander. 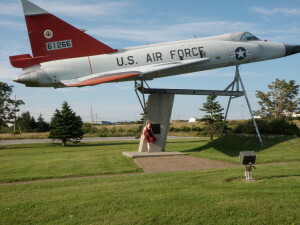 From building the first house on Hamilton Street when Gander moved from next to the airbase, to serving on council, and as mayor, to helping form the museum, Cooper shows a passion for aviation and the aviation town that is Gander. Inside the North Atlantic Aviation Museum. Photo by author 2014. 2010 Crash Victim’s Daughter Seeks Closure, The Telegram. September 21, 2010. 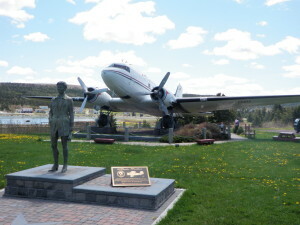 2000 The Newfoundland’s Airmen Memorial. “We Will Remember”: War Monuments in Canada World Wide Web Site. Accessed 14 April 2016. 2015 A Gentlemen’s Agreement: Newfoundland and the Struggle for Transatlantic Air Supremacy. 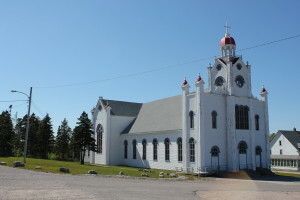 Boulder Publications: Portugal Cove-St. Philip’s.